Sometimes I have moments when I catch myself doing something that I very clearly learned from my dad. This happened on Saturday as I stood over a pile of freshly washed cilantro and dutifully plucked the leaves from the stems. This was my dad’s ritual. Every Saturday morning when we returned from the grocery store, he would immediately begin the process of cleaning his vegetables, paying extra care to the leafy greens. He would rinse them three times in ice cold water, spin them dry, remove any blemished leaves, trim the stems, and roll them up in a clean dish towel to dry. Several hours later he would remove the bundle of greens from the fridge, unfurl the towel, put the greens in a plastic produce bag, and gently press the air out of the bag to form a vacuum-like seal. I don’t do any of that. Or at least I never used to do any of that until the spirit caught me on Saturday and I was compelled to wash bunch after bunch of herbs – cilantro, parsley, mint – like a hypochondriac washing her hands after exiting the metro. It was a strange green purgatory and at the end I had very little to show for it, just the same herbs in the same bags, only cleaner. This is how I feel about most tedious chores and tasks – if the payoff isn’t large and immediate, I either rush through the job or don’t bother doing it all. Like rinsing and picking through lentils. I have never discovered a pebble in my lentils, why would I start actively looking for them now? Or sifting flour before adding it to a batter. Can anyone really tell that you took 10 extra minutes to remove a few lumps and 20 minutes to figure out how to clean the sifter without gumming it up with flour paste? And yet, there I was spending several hours cleaning herbs that I would ordinarily just rinse under some water, before mincing together the stems and grit and yellowed leaves without any noticeable consequence. So, you can imagine how I felt halfway through the second bunch of cilantro, like waking up from a trance and not knowing how or why I had ended up in my kitchen mindlessly pumping my salad spinner. As soon as the realization of what I was doing dawned on me, I quickly determined that the final bunch of parsley didn’t need washing. Still, for a few fleeting moments I felt like I had truly channeled Sig, which left me both comforted and proud. You might be wondering what I did with all these ridiculously clean herbs and I am quite happy to tell you that I made our friends a Moroccan feast, the crowning glory of which was a spicy carrot salad, bathed in harissa and tossed with preserved lemons. I had never used preserved lemons before, but my dad had. I couldn’t tell you the recipe he used, but I remember his excitement at finding them in a specialty food store and my curiosity at the jar sitting on our kitchen counter, the lemons looking like museum specimens floating in a jar of formaldehyde. Between this strange ingredient and the ridiculously clean herbs sitting on top, the carrot salad felt and tasted like the perfect homage to dad and the perfect way to end a weekend of grueling herb-cleaning. Cut the carrot to rounds about 1/2 cm thick. Boil 4 cups of water and add salt. Boil the carrot for 10 min until soft but still have some bite to it. Drain, let dry and cool. 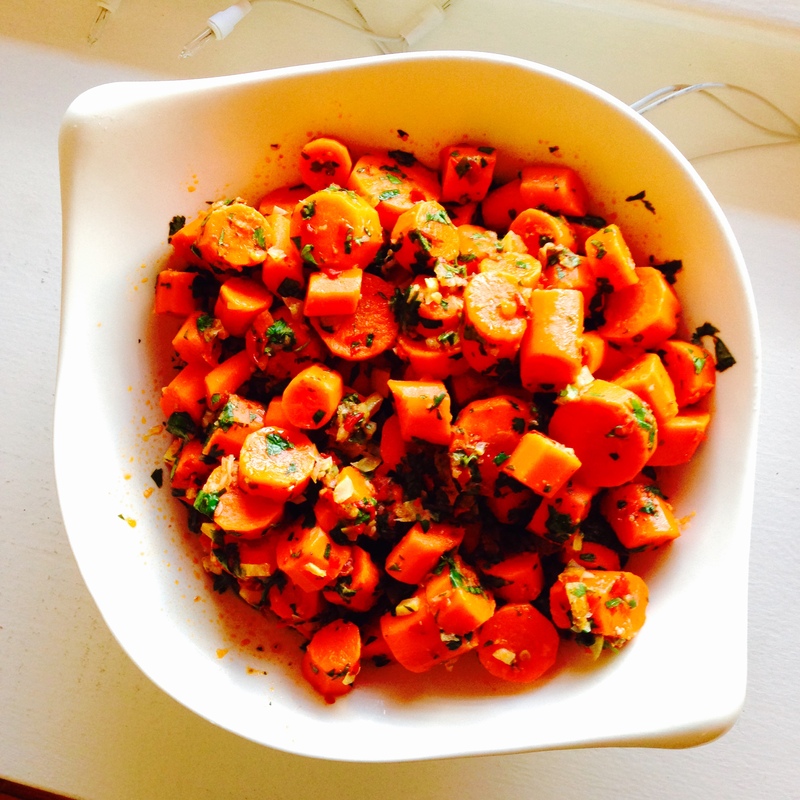 Mix the carrot with the rest of the ingredients and let it sit in the fridge at least over night. Before serving check and see if the salad needs more salt or vinegar. Serve at room temperature. Tags: Moroccan, recipes, salad, spicy | Permalink.